Here's co-p with Mr V (a week or two late, but that sums up my life - I sent out my 'Christmas' cards on NYE). I went for a walk yesterday with the hoyden about town and she took some nice photos of Mr V (looking every inch an action dog). 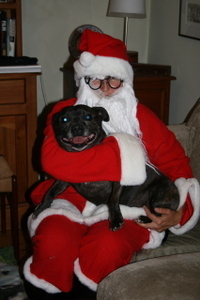 Through a comment on her post, I found this incredible Flickr site devoted to photos of staffies! Here's an old (2006) photo we have of a bunch of staffies - Varsh is on the left. I've been feeling surprisingly bad about Lot's death. "Surprising? It's not surprising - she was an important part of your life for 13 years, a member of your family", my friends tell me. 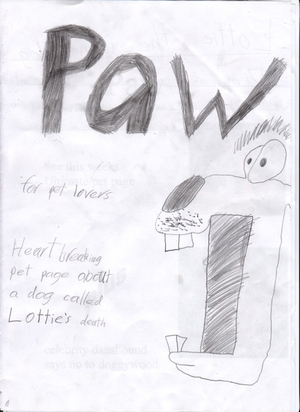 We had Lotte put to sleep at home yesterday afternoon. She was somewhere around 14 years old and had lived with us for 13 years this month. She wasn't just a companion but influenced the direction and progression of our lives in ways that are too intimate to write about here now. The Lotster is on a drip at the vet - she has a raised urea level again, which means kidney failure. In one way she's not as bad as last January, when she literally didn't eat or drink or wee for 24 hours at one point and was very lethargic. She's still able to eat a bit, able to urinate and walk around. But she's skin and bone and seems worn out. I've been meaning to write about Lotlot for awhile, as I've been aware of hardly mentioning her since she recovered from her near-death illness in January. Now she's sick again, though not quite as bad as then.